I've been talking about the Texas Panhandle a lot lately, and I just now realized somebody might not know what exactly I'm referring to as the Panhandle of Texas. Silly me. I just like to think everyone's world revolves around the Panhandle, but in case yours doesn't, this post is for you! 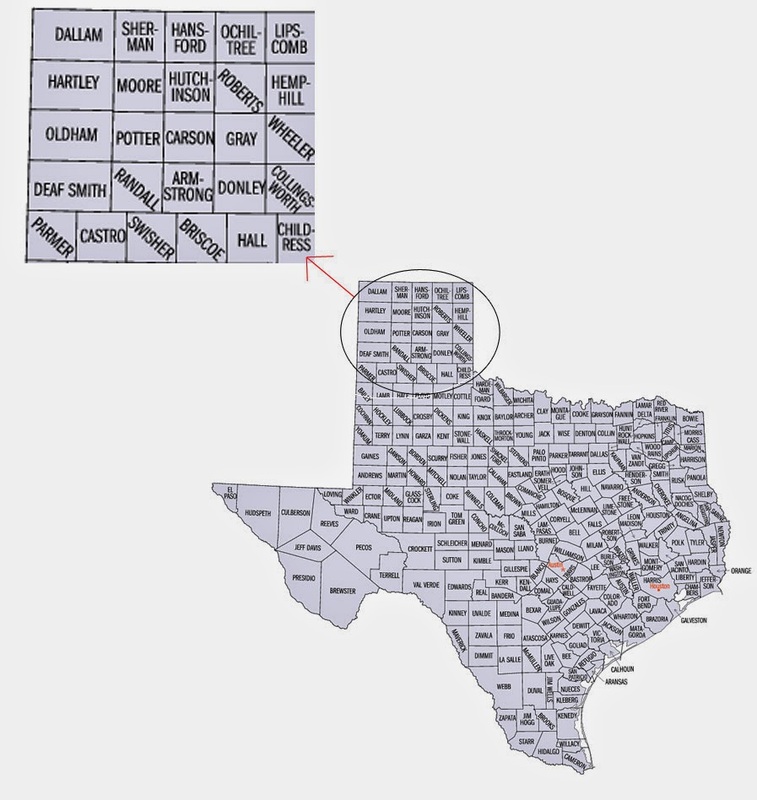 Like the above map shows, the Texas Panhandle is made up of the 26 most-northern counties. Warning: A healthy dose of imagination is necessary for the following exercise. If you close one eye, raise your left hand, and squint with the other eye, you can almost envision that group of counties as the handle of a pan. Apparently, Texas settlers were really imaginative. The Panhandle is home to one town large enough to be classified as a "city," or at least in my opinion. Let's be honest, 17,000 people living in one place is a large town, and in no way should count as a city (sorry, Pampa). Anyway, back to our city, our one city is Amarillo. (Yes, it is completely OK to be singing "Amarillo by Morning" right now. That is music gold!) Amarillo is the 14th most populous city in Texas, and is the major economic center for the Texas Panhandle, as well as the Oklahoma Panhandle and eastern New Mexico. While Amarillo is an industrial hub for railroad, oil and gas, and a few other industries, agriculture plays a large role in Amarillo. Around 25 percent of all U.S. beef is processed in the area. Other Texans generally refer to the Panhandle as the red-headed stepchild of Texas, mainly because they aren't cool enough to live here. The Panhandle is pretty awesome, and the people here are the best in the world. Hopefully, this brief overview helps those of you who aren't so familiar with the Texas Panhandle. As always, if you have questions, I'd be happy to attempt to answer them! This is the fourth day of my 30 Days of Texas Panhandle Agriculture Series. To read more, please visit this introduction post. If you have questions or ideas about Texas Panhandle agriculture, I'd love to hear them! Oh the Panhandle! I called it my home for a little over a year and it is indeed a place all of its own. We shopped in Amarillo, toured the Palador Canyon, ate some great food and made some good friends. Dalhart was where we lived and from what I hear it has grown and changed in the past 12 years since we lived there. 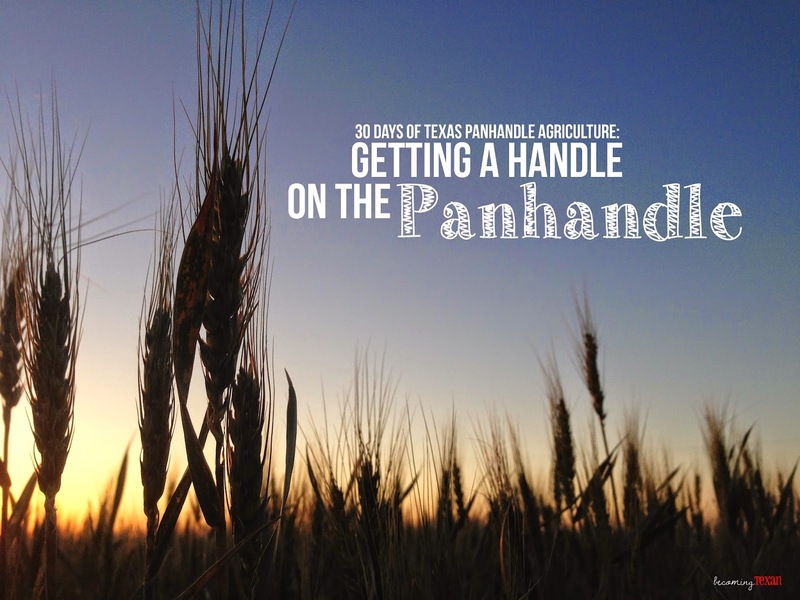 Very excited to read more of your 30 days of Texas Panhandle Agriculture! The change in landscape in the panhandle is as vast as the types of agriculture. I will be back! If you have a chance and would like to, please think of joining the Country Fair Blog Party. The month of November is themed, "A Time of Giving". Your series would be a great addition. Thanks so much for reading and commenting! I will definitely check out the Country Fair Blog Party this weekend when I get home!